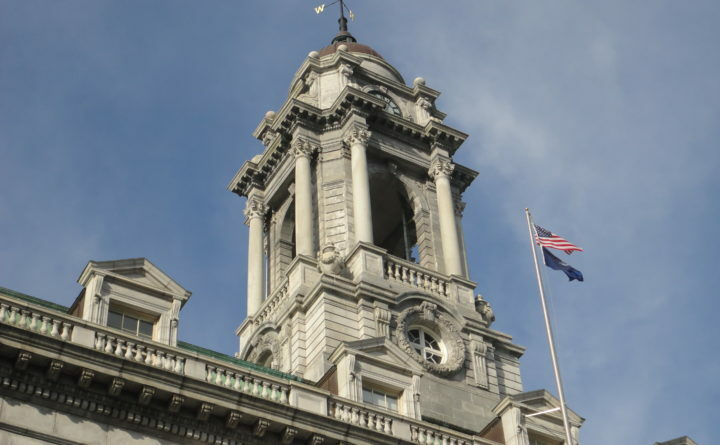 The Portland City Hall clock tower is shown in this Bangor Daily News file photo. PORTLAND, Maine — Maine’s largest city was on pace to set a record nobody wanted on Sunday — coldest day for the midpoint of April in recorded history. The bitter weather wasn’t unique to Portland, as much of northern New England was under a winter weather advisory from the National Weather Service while a spring storm brought ice, snow, freezing rain and heavy wind to three states. The service said Vermont would be under advisory for the longest, with parts of the state under advisory until 11 p.m. on Monday. The National Weather Service had its eyes on Portland, which was flirting with the possibility of setting the lowest maximum temperature ever recorded on April 15. The lowest recorded high temperature for that day was 37 degrees in 1979, and the temperature in the city was 28 degrees at midday Sunday with little sign of warmup. The service said it could not make an official call about a temperature record until Monday morning. Ice was a concern in Portland, elsewhere in Maine and in all of the three northern New England states, said Nikki Becker, a meteorologist with the National Weather Service in Gray, Maine. The weather service’s temperature records for Portland go back to 1940. April 15 is a day already reviled by many because it’s usually Tax Day, though this year it’s postponed to April 17. Southern Maine residents woke up to the two-day reprieve only to be greeted by slick sidewalks, cars coated in ice and sub-freezing temperatures. The Portland Sea Dogs minor league baseball game against the Binghamton Rumble Ponies was postponed due to the inclement weather. A winter weather advisory was issued in Vermont from the Massachusetts border to the border with Canada. Southwestern Vermont and parts of central Vermont were also under a wind advisory, the service said. Green Mountain Power said in a statement that it was ready to respond to outages that could rival an October storm that knocked out power to more than 100,000 customers. Gusts could top 65 mph along the western slopes of the Green Mountains starting early Monday, the utility said. “We are hoping for the best, but we are actively preparing for outages,” said Mary Powell, the president and CEO of Green Mountain Power. All of New Hampshire was under a winter weather advisory on Sunday. The advisory was limited to central, southern and western parts of Maine.